The National Hydro Meteorological Forecasting Center last night warned that Typhoon Tokage has entered the East Sea with constantly changing path jeopardizing boats at sea. 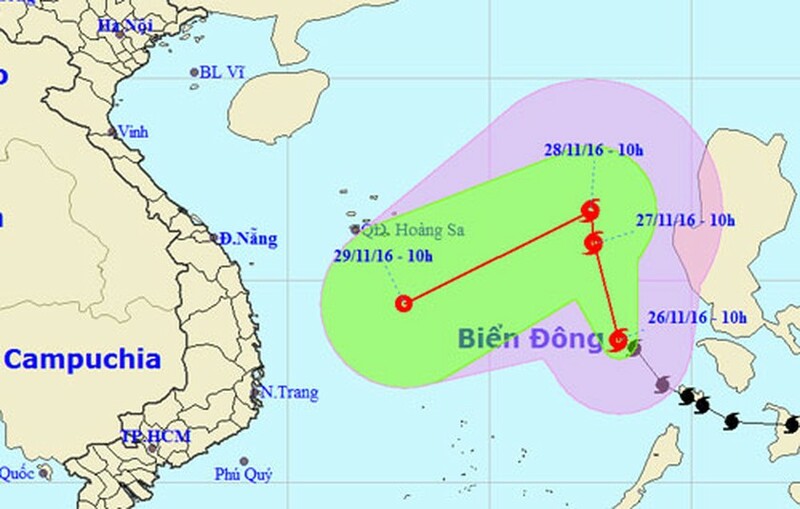 It is the ninth storm entering the East Sea and affecting Vietnam this year and expected to move north-northwest and north-northeast later at the speed of 10-15 kilometers an hour. By this afternoon, Tokage will be centered 610 kilometers east of the Hoang Sa (Paracel) Islands. The wind power near the center of the storm reached level 10 moving 89-102 kilometers an hour. Within the next 24-48 hours, its direction will change to move west-northwest at 5-10 kilometers an hour towards the coast of the central region of Vietnam. The center of the typhoon will locate 470 kilometers east-northeast of the Paracel Islands with the fury degrading to level 9 traveling 75-88 kilometers an hour tomorrow afternoon. Hydro-meteorological stations in Asia-Pacific say that the path of the typhoon has constantly changed because it has been affected by a northward strong cold front which has traveled south. Under the influence of the cold front, the Gulf of Tonkin has been choppy with strong winds. Provinces from Quang Binh to Da Nang has seen medium to heavy rains. Northern and north-central provinces have been cold with the lowest temperatures swinging from 13-16 degrees and 8-11 degrees in mountainous areas. The cold snap might intensify to lengthen the cold weather in the above areas until the end of November. The storm in combination with the cold front will trigger heavy rains in provinces from Da Nang to Khanh Hoa from November 29 to December 2 with the precipitation of 200-400mm. Rivers will swell putting these areas in a danger of landslide and flashflood. The National Committee for Search and Rescue has sent a dispatch to local authorities from Quang Ninh to Ba Ria-Vung Tau provinces, northern provinces and relevant ministries asking them to brace for the ninth storm in the East Sea and prepare for flooding and cold weather in the northern and central regions.